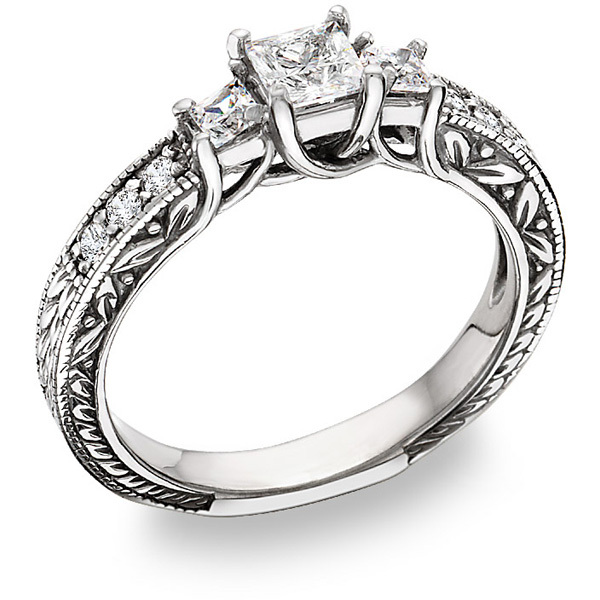 A truly unique cz ring, our Three Stone Princess Cut "Floret" Design Diamond Ring is reminiscent of the Victorian age, yet has a beautiful, modern flair. Each high quality cubic zirconia stone is hand-set by a diamond setter, to achieve the highest quality and authentic looking diamond simulation. Cubic Zirconia Carat Weight eq. of 1.09 Carats, with a 0.50 Carat equivalent center stone, 2 0.25 carat equivalent side stones, and 6 round accent stones. Apples of Gold Jewelry guarantees the "Floret" Design Three Stone Princess Cut CZ Ring to be of high quality and an authentic engagement ring with real diamonds, as described above.